As a bestselling author on Amazon, Dr. Wong is a civil engineer by training, and an award-winning hydrologist. Having lived a worldly life, he now lives spiritually in the midst of modern Singapore. Nowadays, he serves the world as a freelance consultant and trainer. He is also an editor and has authored books of four different genres: engineering, philosophy, self-help and spirituality. Since 2009, his books have been available on Amazon and many other online bookstores worldwide. In 2012, 2013 and 2017, he was featured on the Radio 938LIVE programme "A Slice of Life Hour". He has also given more than 30 talks at the Singapore Writers Festival, Read Fest, Human Library Singapore, Heartlands Book Club, Next Chapter Book Club, Booktique bookstore, Financial Services Consumer Association, as well as various Meetup groups. Further information about Dr. Wong’s work can be found on his website (http://wisdomlife.page4.me/) and the FB page (https://www.facebook.com/wisdomlivelife). 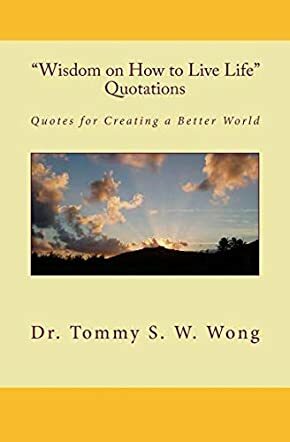 In “Wisdom on How to Live Life” Quotations: Quotes for Creating a Better World by Dr. Tommy S.W. Wong, each quote provided within the book packs a lot of punch into a little amount of space. These are similar to the quotes that we might find on social platforms of today’s day and age, such as Facebook and Instagram. The difference here being that this book groups the quotes into several different chapter areas. Those chapters are Body and Soul, On Life, We Are All One, The Masters, On Politics, On Society, and lastly, A Better World. The varying fonts provided in the quotes make each turn of the page an interesting find, and offer a different perspective. The quotations come off as vibrant in a myriad form of artistic flavors. There is definitely a market for a book like this today, given the popularity of quotes on social platforms. Such a brief quote can sometimes make the biggest difference in a person's life when they stumble upon it, depending on what kind of frame of mind they are in at the time. The varying fonts and colors of the quotes were also fun and creative. And I loved that they were grouped into specific areas, one of those areas being politics. Dr. Tommy S.W. Wong’s book, “Wisdom on How to Live Life” Quotations, is a treasure trove of words that delve into motivations and helpful bits that can assist someone in life as they meander through the ups and downs that come with living in this world. I feel that a quote stumbled upon at the right time of a person’s life can sometimes make all the difference to what direction that person might take. I highly recommend this book to anyone who is as obsessed with quotes as much as I am. You will not be disappointed by what you find within these pages. Sometimes the smallest things can make the greatest impact, and can be all the difference we need for a positive life change. I really enjoyed this book.